Anyone interested in purchasing her, please be sure to check my Etsy shop on Monday evening around 8:00PM EST. She is a very fun doll. She’s scented with Strawberries and Cream scent, which smells so yummy! Very close to the smell of the strawberry shortcake dolls. She measures 16″ height. 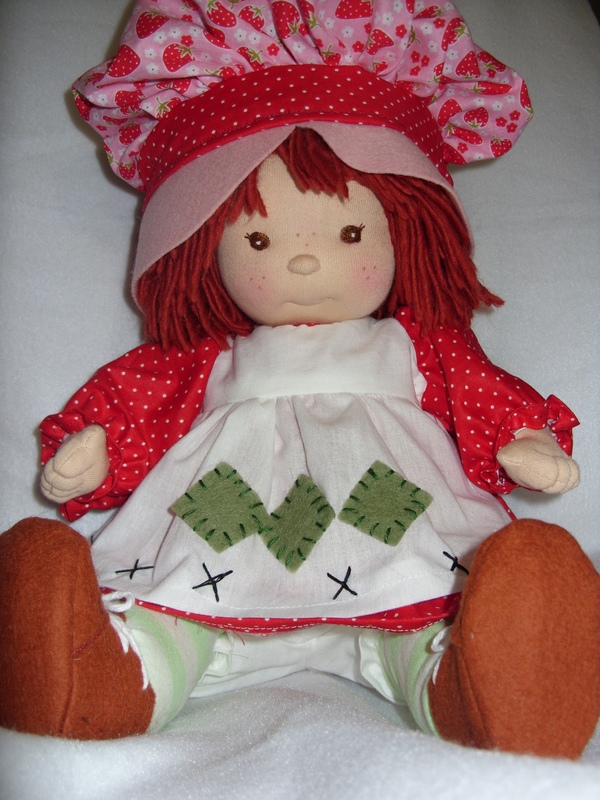 She wears the classic strawberry shortcake costume, the poofy strawberry hat, red dress, apron, green striped stockings, pantaloons, brown shoes. She is stuffed with 100% wool and her hair is 100% wool yarn. She has adorable freckles too. Her apron is removable from the dress to give her a different outfit option (more pics of all that to come) She also has magnetic inserts in her mouth and thumb, so when she’s not eating strawberries, she can take a pacfier or her thumb! She has brown eyes, red hair, fingers, toes, belly button and bottom too. Her price will be $185 + shipping. Absolutely adorable! How did you make the outfit and shoes? And where did you get the strawberry scent? Thank you! For the outfit, I already had a dress pattern, then I altered lt a bit to make the apron. The hat just needed the right fabric, which I found on etsy. The shoes I made from wool felt and the stockings from striped knit fabric. The strawberry scent was the “skin safe” type purchased from tristate candle company.